The double-sided protective edges and the continuous layer of high quality air cellular bubbles provide outstanding stiffness and puncture resistance… 100% recyclable…. 2016 Panini Classics Hobby Football. 2016 PANINI CLASSICS FOOTBALL HOBBY. Manufactured by Panini. - Classics goes old school with rare parallels! Check your base cards for exciting surprises! Also look for buyback autographs falling one per case on average! Boxing Single Cards. Hockey Card Lots. Hockey RC Lots. Hockey Boxes & Cases. Hockey Single Cards. Football Boxes & Cases. Football Sets. Football Single Cards. LOOK FOR THE HOT ROOKIES, AND WATCH FOR THE RANDOM INSERT CARDS. Look for 2016 Draft class Rookie cards and autographs possible. Carson Wentz, Dak Prescott, Elliot, Goff and many more. This box is Factory Sealed. Look for Key Rookies Including. Boxing Single Cards. Hockey Card Lots. Hockey RC Lots. Hockey Boxes & Cases. Hockey Single Cards. Wrestling Trading Cards. Football Boxes & Cases. Football Sets. 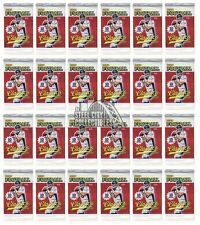 2016 Panini Contenders Football MASSIVE 24 Pack Factory Sealed Retail Box ! Look for Cards and Autographs of Top Legends and Veterans in Insert Sets Legendary Contenders Autographs, MVP Contenders Autographs, NFL Ink and Super Bowl MVP Autographs! 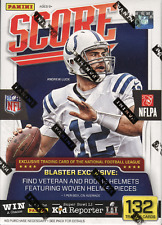 Look for Popular Inserts including Rookie of the Year Contenders, MVP Contenders, Round Numbers and Many More! Look for Any 2016 Draft class Rookie cards and autograhs possible. Carson Wentz, Dak Prescott, Elliot, Golf and many more. Find (8) Rookie Cards Per Box . item you will recieve as shown in picture. Look for Any 2016 Draft class Rookie card and autographs possible. Carson Wentz, Dak Prescott, Elliot, Golf and many more. 2016 Panini Prestige FB Pack (Ezekiel Elliot Dak Prescott Rookie/Auto/Jersey)? Dak Prescott, RC. Ezekiel Elliot, RC. 2016 Panini Prestige. base set, inserts, auto, relic. etc. For any single cards needs to complete your sets. Jared Goff, RC. Baseball RC Lots. Hockey Card Lots. Hockey RC Lots. Other Sports Single Cards. United States. Non-Sports Single Cards. Non-Sports Boxes & Cases. Insert Card Sets. Look for Any 2016 Draft class Rookie cards and Autograhs are possible. Carson Wentz, Dak Prescott, Elliot, Goff and many more. 12 Rookies, 3 Green Prizm, and 6 Inserts per box on average. 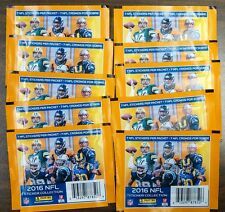 2016 PANINI Donruss Optic Football Hanger Box Pack ? Wentz Prescott RCs Autos ? 2016 Draft class Rookie cards and autographs are possible. Carson Wentz, Dak Prescott, Elliot, Goff and many more. This Sale Is for (1) Sealed (2016 Panini Donruss Optic) Football Hanger box (12) cards per box. Look for Any 2016 Draft class Rookie cards and autographs possible. Carson Wentz, Dak Prescott, Elliot, Jared Goff ,tyreke hill and many more. (7) Rookie Cards and (1) Blaster Exclusive Pennant card on average per Box. ROOKIE SIGNATURE CUTS: Rookie Signature Cuts features autographs by the top rookies out of the 2016 NFL Draft, all sequentially numbered to 199 or less. Also look for black versions sequentially numbered to 5 and 1-of-1 printing plate versions. Collect all 100 Card Base Set and Sequentially Numbered Rookie and Retired Cards! This Product is Loaded! Good Luck with your Pulls! Note on Factory Sealed Boxes and Cases and Graded Cards. Be Sure to Check out our 1,000?. 2016 Panini Absolute Football Jumbo Pack 12-Pack Box - Wentz, Prescott, Goff RC! Year: 2016. - First Rookie Cards with 2016 draft information. Look for updated draft information for all rookie cards in 2016 Prestige! There are 100 total rookies, with 10 short-prints versions that fall two per case! Look for Any 2016 Draft class Rookie cards and autographs also possible. Carson Wentz, Dak Prescott ,Ezekiel Elliot, Jared Goff and many more. This Sale Is for (1) Sealed (2016 Panini Donruss ) Football Hanger box (50) cards . 2016 Panini Football EXCLUSIVE Factory Sealed HUGE JUMBO FAT Pack Box-240 Cards! That is (24) ROOKIE CARDS, (24) PARALLELS and (24) INSERTS in this Factory Sealed Box on Average ! Look for Insert Cards including MVP Predictor, Heir to the Throne Signatures, First Impressions, Squires Jerseys & More! Year: 2016. Card Manufacturer: Panini. Infinite Potential features 10 of the hottest rookies for the 2016 season! - The Locker Room Legends Auto set includes 10 of the best quarterbacks ever, numbered to their jersey number! Look for Any 2016 Draft class Rookie cards and autograhs possible. Carson Wentz, Dak Prescott, Elliot, Golf and many more. (7) Rookie Cards and (1) Blaster Exclusive Pennant card on average per Box. 2016 Panini Football Jumbo Pack Sealed Box - Loaded with Rookies!! Look for Rookie Cards and Rookie Autographs from Dak Prescott, Carson Wentz, Ezekiel Elliott, Jared Goff, Paxton Lynch, Joey Bosa, Jalen Ramsey, and more! Look for 2016 Draft class Rookie cards and autographs possible. Carson Wentz, Dak Prescott, Elliot, Golf and many more. 2016 Panini Origins Football Hobby 7 Card Pack/Box - FACTORY SEALED! 2016 Panini Origins Football Hobby Box. - Origins Football debuts in 2016 with a plethora of on-card and patch content! - Pull stunning multi-signed cards and booklets in Quad Rookie Autographs, Six-Star Signatures Booklet, Passing Star Signatures Booklet and Rushing Stars Signatures Booklet! Year: 2016. Card Manufacturer: Panini. Manufacturer: Panini. League: NFL. Sport: Football. This exclusive die-cut parallel features the top rookies from the 2016 NFL Draft! Look for Tools of the Trade Materials Double (max #'d to 99), Triple (max #'d 99), Quad (max #'d 25), and Five (max #'d 5). Year: 2016. Year/Season: 2016. Look for Rookie Signatures and Rookie Jersey Signatures from the 2016 rookie class, including Holo Silver, Gold, Holo Gold, and Platinum parallels. Card Manufacturer: Panini. NFL Panini Absolute Football 2016 Sealed / Orig. 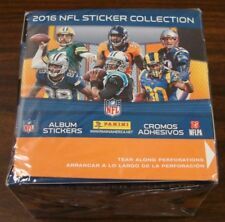 NFL Panini absolute football 2016 Football NFL sealed/orig. Saison 2016. Erscheinungsjahr 2016. Serie Absolute. 2016 Panini football features a 300-card base set including 200 base and 100 rookies! Chase early signatures of the 2016 featured in full colors of NFL rookie class! -2016 Panini football debuts with tons of fun, unique content. 2016 Panini Football features a 300-card Base Set including 200 Base and 100 Rookies! - 2016 Panini Football debuts with tons of fun, unique content. - Alle Produkte sind auf Lager, keine Wartezeit. - Alle Preise inkl. Alle Produkte sind auf Lager, keine Wartezeit. - Alle Preise inkl. Erscheinungsjahr 2016. Serie Prestige. Besonderheiten Rookie. Besonderheiten Insert Card/Chase Card. Saison 2016. Erscheinungsjahr 2016. Serie Rookies & Stars. Erscheinungsjahr 2016. Serie Prestige. Besonderheiten Rookie. NFL Panini Absolute Football 2016 Football NFL Sealed/Original Packaging Box 24 Packs 240 cards!